Though this German floodplain forest lacks a presence of silver maples, it resembles the floodplain forests of the northeastern United States. Photograph by Christian Fischer. The natural range of the silver maple stretches as far north as southern Quebec and Maine, south to Georgia, Florida, Mississippi, and Louisiana; and west to the Dakotas and Minnesota. In the western United States and parts of Europe, the silver maple has been introduced ornamentally. Silver maple trees thrive best where they grow naturally—stream banks, flood plains, and lake edges, though they will survive anywhere with enough moisture. Silver maples grow naturally in a few different habitats. They play a special role in Vermont floodplain forests, low-lying areas adjacent to rivers or streams. Several features characterize floodplain forests—natural levees occur next to the riverbanks, the active channel regularly floods over its banks, and abandoned river channels may be present, such as oxbows or backswamps. There are multiple categories of floodplain forests, two of which are dominated by silver maples. A floodplain forest where silver maples grow principally with ostrich ferns is usually considered a wetland, and these forests annually receive a layer of rich, coarse soils from flooding. Cottonwood trees are another important element at some sites, as well as American elm, hackberry, and boxelder trees. The ferns that grow in these forests routinely tower over human heads and are quite a sight to behold. Though the rich soil obviously benefits the plants in this type of community, it can also allow invasive exotics to overpower the native species. These forests occur throughout New England, Pennsylvania, Maryland, and parts of Canada; similar communities are also present in the Midwest. These forests also experience soil deposits from flooding, sometimes in spring and fall. The soil tends to be much finer textured than where the ostrich fern is present. Green ash and American elm comprise the canopy in addition to the silver maple. Shrubs are rarer here, but sensitive ferns cover the ground nearly completely, sometimes mixed with other herbs. These types of forests provide important habitats for animals such as river otters, beavers, muskrats, and mink. Another common environment dominated by Acer saccharinum is the silver maple-ash swamp.These swamps appear in poorly drained basins adjacent to lakes or, occasionally, rivers. 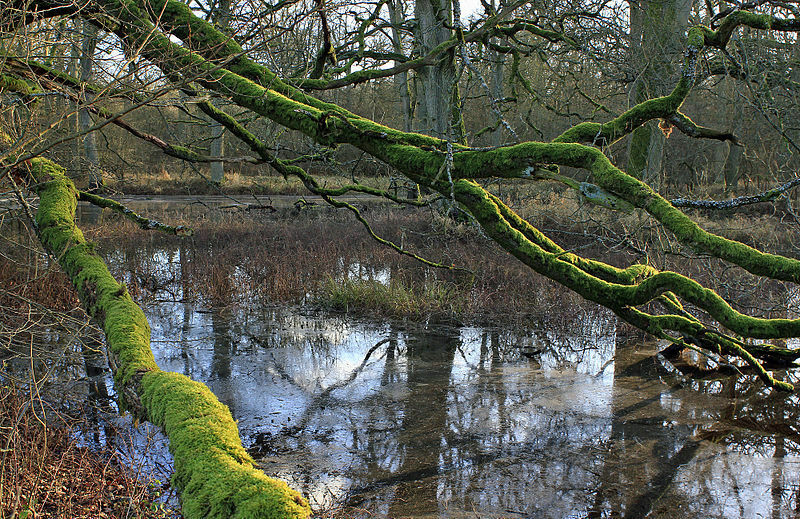 Contrary to the annual flooding that occurs in floodplain forests, these swamps experience year-round wetness with little fluctuation in water level. The ground is thickly covered by shrubs of all sizes and the canopy is populated by green ash, American elm, red maple, and swamp white oak in addition to the silver maple. Wherever the species is found in the wild, it is depended on by many animals. Prolific production of the large samaras feeds birds such as finches, wild turkeys, ducks, as well as mammals such as black bears, chipmunks, and voles. At the end of winter, when food is scarce, squirrels and other animals feed on the large buds. Beavers are fond of the thin bark for eating and building, while rabbits and deer subsist on the leaves. It also feeds various insects (caterpillars, aphids, beetle larvae, etc.). Cavities often develop in the trunks of silver maples which provide nesting ground or space for animals to build dens.